We, too are invited into this time of introspection. As we journey through this season of Lent, some will choose to give up something. Some will go about their lives as they typically do. Some will choose to be more reflective. Whatever your practices this season, might you consider joining us in this weekly practice? Share with the community how you’ve responded to each theme for the week. No explanation needed, unless you want to. Here’s how it’s going to work: Every Sunday, we’ll post a theme that we’re asking you to sit with that week. As you think about the questions and images revealed in that theme, share them with us on social media using the # for that week. Perhaps you’ll share a photo of how that topic speaks to you. Or maybe it’s a Vine or Instagram video you created. Whatever it is, we hope these 40 days of Lent will be a time to open your eyes and heart to what’s already at work around you. 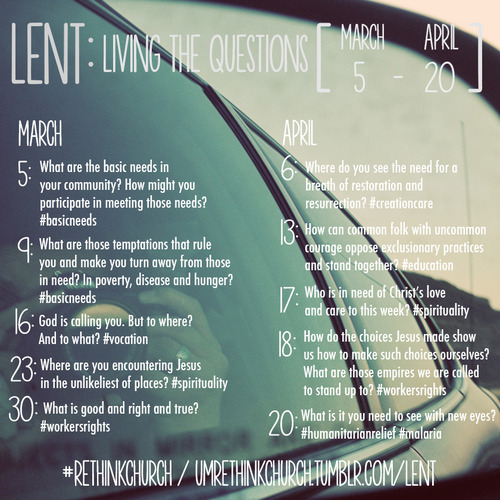 Tag us on your instagram photos with @rethinkchurch or on twitter [@umrethinkchurch] with#rethinkchurch and #40days. We’d also love for you to share your photos on our Pinterest board! We’ll be pinning what you share [as much as we can keep up] on our Pinterest page, so check back regularly to see what others have shared! This project is hopefully more about the practice of paying attention and being intentional, than it is being the best artist [though we encourage you to get creative!]. If you don’t have instagram or twitter, we’d still love for you to share your reflections. Just share them on your facebook page and tag us, or post them on our facebook wall. Need a daily reminder? Sign up to receive a text or email here. The questions are posted in the image above. The scripture and reflections will be posted every Sunday morning, but for those of you who like to plan, we’ll update this page so you can have those in advance, too. How do you connect to this project online? Sign up for weekly text or email reminders for the weekly question [with a verse and reflection if you want something to reflect on throughout the day].